When news of a proposed luxury cinema with stage facilities, and seating over 2500 patrons was announced in the local press, the Picture House and Theatre Proprietors of Wigan were greatly concerned as to the damage the proposed venue would do to their box office. A petition was duly dispatched to Wigan Corporation planning department requesting that planning permission be with-held. A vote was taken by the planning committee and the request to withhold permission was defeated 27 votes to 5. The request was denied. Construction went ahead and the Cinema /Theatre Cafe were ready for business on March 7th 1938. 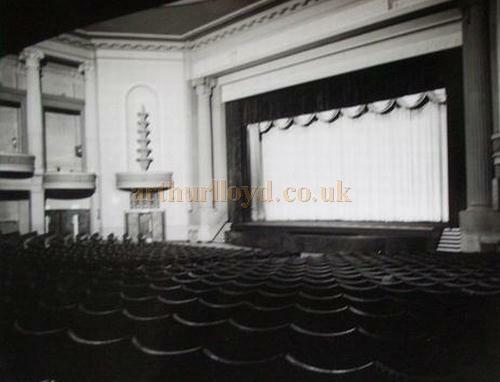 Right - The auditorium and stage of the Ritz Cinema, Wigan - Courtesy Brian Elsey, Wigan World. Work on the erection of Wigans Super Cinema to be built in Station Road will commence early next month and the building will be opened in November 1937. Plans are at present being prepared by a Glasgow architect. 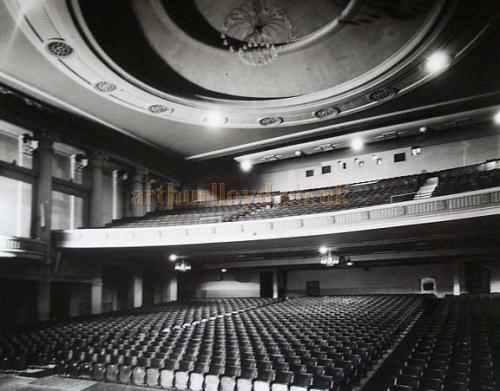 Right - The auditorium of the Ritz Cinema, Wigan - Courtesy Brian Elsey, Wigan World. 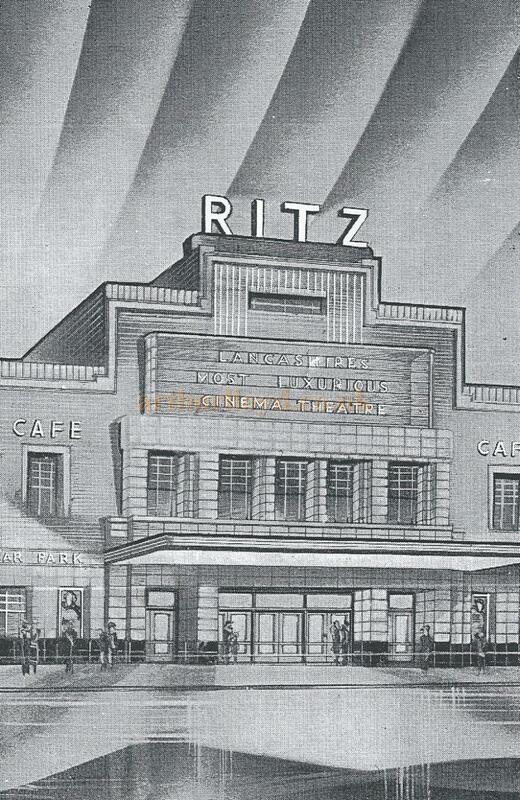 The new cinema will be called The Ritz and it will form part of a chain of 250 cinemas owned by the Union Cinema Co.Ltd. The Union Group is one of the most important in the cinema industry in this country. The new Ritz will seat 2040 and will cost over £70,000 to build. The cost of erection will work out at over £30 a seat. All the latest ideas in modern design will be incorporated in the new building. Externally a prominent façade clad in white stone with gilt metal work and an illuminated canopy will establish an architectural standard in the neighbourhood. The cinema of today actually enhances its surroundings and it is confidently expected that land values will increase in the area and further new buildings will be erected in the Station Road area. The Cinema on a par with that opened a fortnight ago by the same company in Huddersfield will provide Wigan with a handsome Café-dansant, equipped with an all-electric kitchen. There will be a full stage for Variety and Music, with a Wurlitzer organ, always so essential a part of Lancashire life. The provision of ample leg room between the seats is a feature of the design, while on account of the slope of the site the entrance to the auditorium will be midway between the top of the balcony and the stalls, hence only short flights of steps will be required to reach any level. 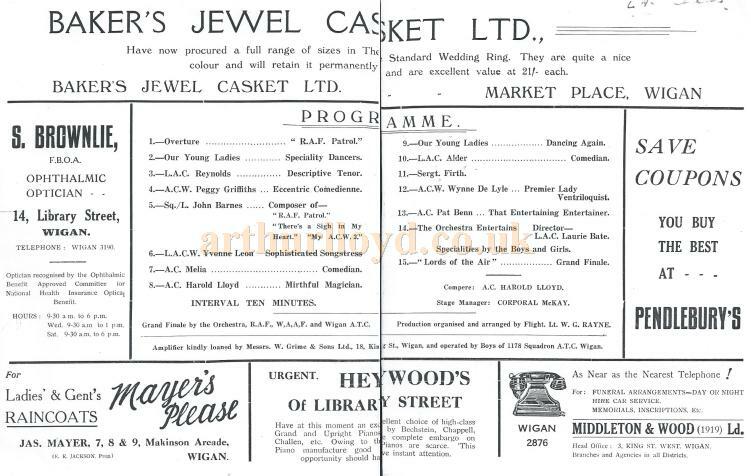 - The Wigan Observer on the 3rd March 1936. The monthly meeting of Wigan Watch Committee was held on Thursday. The committee considered revised plans submitted in connection with the proposed super cinema to be built in Station Road. The Town Clerk recalled that in June the committee approved plans for the new Cinema. The promoters had since written to him and said they were revising the plans to some extent. On making enquiries he found the revision intended was to increase the number of seats from 2040 to 2560. Mr B Griffiths, solicitor of Wigan and Mr G F Green, builder and cinema expert, were waiting on the committee in connection with the proposals to explain the reason for the delay. The Borough Engineer Mr J Dove said the new plans were satisfactory, but he would like to have a clearer explanation of what materials were to be used on the elevations. Left - The stage house of the Ritz Cinema, Wigan - Courtesy Brian Elsey, Wigan World. Alderman McCurdy: I understand in the last plans there was provision for a restaurant and dance hall? The Borough Engineer: There is a café but no dance hall. Though the whole arrangement is different, the general provisions are the same as before. Mr Dove added that the building was fitted for stage presentations and included a radio relay room. Mr Griffiths and Mr Green were called in and the Chairman asked them to explain reasons for the delay and whether the plans submitted were final plans. Mr Griffiths replied that it was discovered that the cost of the building would be prohibitive so far as supplying seats at the price Wigan was prepared to pay was concerned, and it was purely by accident that Mr Green came to know of the situation, and he decided he could use the site to greater advantage and increase the seating, without diminishing the value of the materials used. Regarding the question as to when building would begin, his clients said that as soon as the plans were passed the contracts would be made out and work would be started this month. It was expected that building would take 30 or 40 weeks. These were final plans from their point of view. 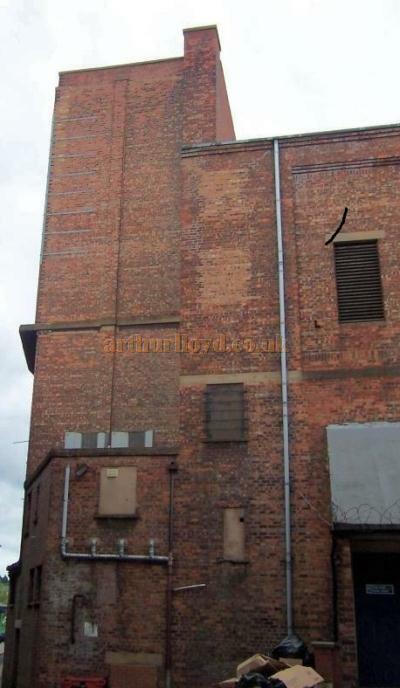 The Borough Engineer asked what were to be the materials of construction to the side and rear of the building opposite Watkin Street Crompton Street. Mr Green replied, common brick. Mr Green said that on the front in Station Road the elevation would be cement finished in atlas white. Mr Dove : We want you to build a nice building in Wigan. Right - The stage house of the Ritz Cinema, Wigan - Courtesy Brian Elsey, Wigan World. The committee considered the position, and the Chairman then informed Mr Griffiths and Mr Green that the committee approved the plans but were very keen that they should carry out the committees wishes in using rustic brick on the Crompton Street and Watkin Street elevations. Mr Green said the Borough Engineer had given them some good suggestions which they had included in the plans. The Mayor (Councillor E.Ball) will declare open Wigans new super-cinema, The Ritz, on Monday next 7th March at 1-45 pm., when the film shown will be, Lost Horizon with Ronald Colman in the leading role. This film is the most recent production of Frank Capra, who is possibly the worlds greatest film director, and it is amongst the most interesting films produced for some years. Wiganers will be extremely proud of the new Cinema/Theatre which it is claimed is the biggest in Lancashire. It is a colossal building with accommodation for 2560, patrons and the whole interior is most beautifully decorated, the lighting system being a remarkably fine feature. The Ritz in fact represents the most modern thought in cinema construction and embodies the best scientific knowledge and engineering skill. The building is entirely fire-proof and the exits are so situated that a full house can be cleared within the space of two minutes. The auditorium is built on two levels, there are 881 seats in the circle and 1,676 in the stalls, four boxes are provided two on each side of the auditorium at circle level. All the seats are specially designed to give maximum comfort, while the carpets and appointments harmonise in colour and luxury with the interior decoration. Every foot of air brought into the building is thoroughly cleaned by means of grills in the architecture. This has been obtained by means of close cooperation between the engineer and the architect. The latest Western Electric Mirrophonic sound equipment has been installed. This system is hailed as the greatest advance in film sound reproduction since the commencement of talking pictures. The Western Electric Mirrophonic equipment produces a beauty of sound and astounding clarity along with a wonderful illusion of reality. The accents and inflections of voices can be heard from any portion of the hall, as though the artists are appearing in person on the stage. Singing in particular is clear and beautiful. In the same way incidental sounds are reproduced with perfect fidelity so that exaggerations and distortions are eliminated. There is a car park for patrons and a feature of the cinema is a café with accommodation for 150 people where a coffee to a three course dinner can be obtained. The café is open from 12 noon to 10-30. From Monday to Friday programmes will be continuous at the Ritz. Doors open at 1-30 and films are shown from 2 o clock until 10-45. On Saturday there will be two separate performances at 6-20 and 8-40 pm. Prices of admission are: Matinees, Stalls 6d, and Circle 1s. Evenings, Front stalls 6d, Centre stalls 1s, Back stalls 1s 3p, Back circle 1s 3p, Centre circle 1s 6p, Front circle 1s 10p. Seats may be booked in advance for both evening performances on Saturday at no extra charge. The manager of The Ritz is Mr A W Rifkin, who has had a long association with the entertainment industry. 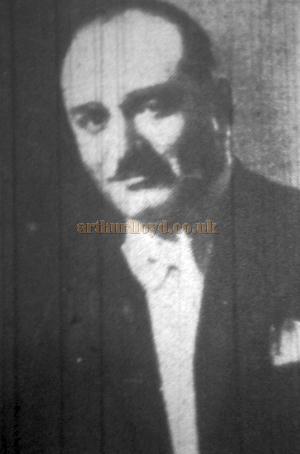 Right - A photograph of A. W. Rifkin, manager of the Ritz Cinema, Wigan - With kind permission the Wigan History Shop - Courtesy George Richmond. Coming attractions include:-For You Alone, with Grace Moore. Angel in which Marlene Dietrich appears with two leading men, Herbert Marshal and Melvyn Douglas. Its All Yours with Madeline Carroll and Otto Kruger and Council for Crime in which stars Douglas Montgomery. - The Wigan Observer, Friday 4th March 1938. The proscenium width was 50 feet with a depth of 20 feet. The width of the stage was approximately 75 feet with the side wall stage right at an angle, reducing the width towards the rear wall. An ancient right of way at the rear of the stage house made a deviation from a right angle, at the back corner, necessary. The stage house was not as wide as the auditorium, the auditorium being approximately 20 feet wider. The scenery get-in was stage left of the back wall. The stage door, due to the considerable slope of the site was at basement level stage left. The stage door led to a passage that ran the length of the stage house with stairs either end up to the stage. On the right were 6 dressing rooms with wash basins (each capable of housing up to six people) with high windows on the back wall of the stage house at basement level. On the right of the passage were three large rooms without natural light, the centre one with access to the curved orchestra pit, (the Wurlitzer organ was never installed), and the side rooms used to accommodate male and female chorus when required, utilising space under the auditorium. 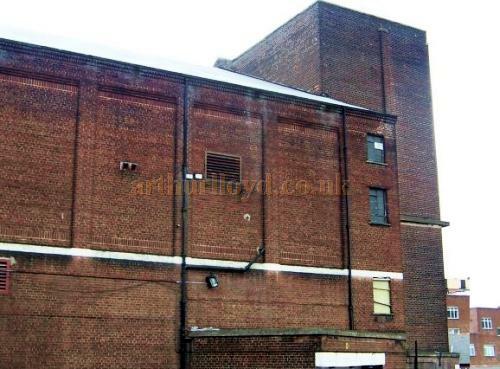 Lavatories and washing facilities were to be found to the left of the stage door on entering, these were available to the general public through a separate door from the auditorium when the stage was not in use for live shows. When the Ritz first opened the stage was dressed with broken white cascade/festoon FOH. tabs, electrically operated. These were lit by footlights and battens operated by an electro/mechanical colour changer. The traveller tabs were in broken white with an art deco design on the leading edges in strips of green red and gold, also electrically operated. The fabric of both FOH and travellers was of a very heavy satin material. Two sets of masking legs were used, one set black and one broken white, and two sets of festoon borders in broken white, with coloured lighting battens in between, three in all. Two carbon-arc follow spots were housed in the projection room. There was no safety curtain. The classically designed auditorium with its many majestic Corinthian columns was decorated in cream, beige, bronze, and gold, and a considerable amount of concealed lighting was used to highlight its architectural details to great effect. All the seating was covered in a dark bronze/plush and oversized seats were used in the front circle. The façade of the building was art deco in style, and the foyer in a very restrained deco style giving the grandeur of the classical auditorium even greater impact. Mr. A. W. Rifkin remained as manager for only a short time, being transferred to a new A. B. C. cinema in Clapham in 1939. His position was taken by Mr. T. Walton, who had been a comedian in the Variety Theatre for 15 years, and it was under his management that the building was regularly granted a Sunday licence and used for Sunday concerts, housing the big bands touring the country at that time. Among the ones to appear at the Ritz during the war years were:- Lew Stone, Joe Loss, Oscar Rabin, and many Forces Dance bands such as The Skyrockets and R.A.F Showboat, a variety show featuring R.A.F. personel. Star names such as George Formby and Dame Eva Turner, the opera star, gave Sunday concerts for charity during the war years. In 1952, Joseph Lock appeared at the Theatre for a weeks engagement, the only occasion up to that time that the Theatre had housed a live show for a week. In the later 50s and 60s the Sunday shows would feature acts such as Buddy Holly, Cliff Richard, Tommy Steel, and The Beatles. 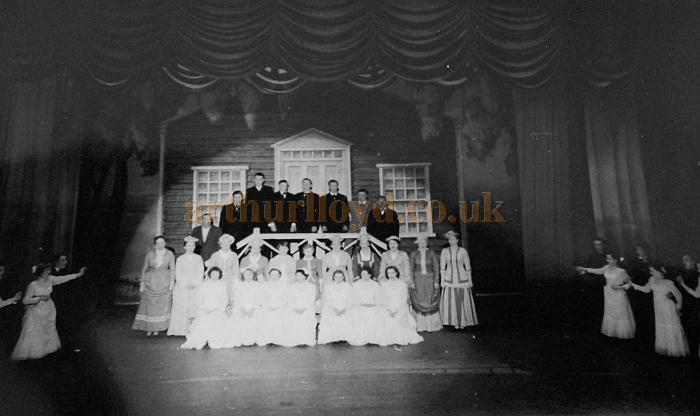 From 1956, after fire had destroyed The Hippodrome, the Wigan Operatic Society would rent the theatre, including the resident staff, for their annual production. This would be the first time the stage facilities had been used to house a full scale musical. The society would present a musical at the theatre each year until 1964 when a production of West Side Story failed to attract an audience in sufficient numbers to enable the society to remain financially viable and was disbanded. In 1977 the building was converted into a three screen cinema using the circle and the former café, which for a short time previous to this had been used as a dance hall. Unit One would seat 480 people, Unit Two 380 and Unit Three110 in the café. The former stalls and stage area was converted into a Bingo Hall which had its own entrance and was treated separately from the cinema. The work cost £300,000. The building was now owned by E.M.I., and renamed the A.B.C Film Centre. 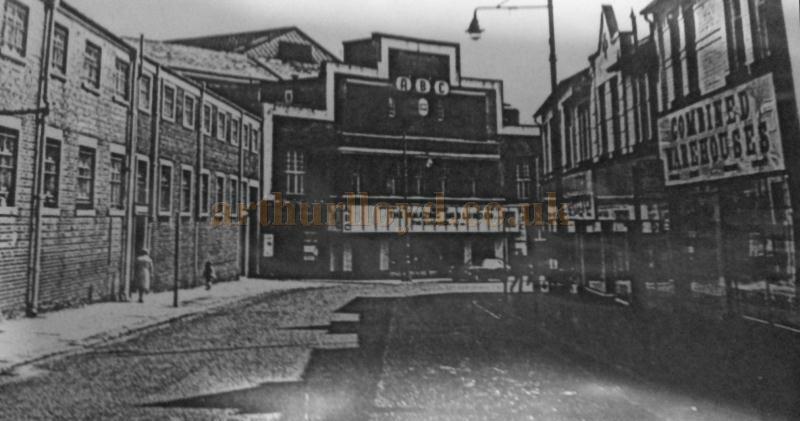 Above - A photograph of the A B C Cinema, Wigan, formerly the Ritz Cinema - With kind permission the Wigan History Shop - Courtesy George Richmond. When a Multiplex Cinema Centre was built in the outskirts of town the building went into decline, finally closing on May 28th 1998. The Ritz was demolished with other buildings to make way for a shopping centre, and a B.H.S store now occupies the site purchased 70 years before by Greens Scottish Circuit. This article on the Ritz Cinema, Wigan was written by George Richmond and kindly sent in by him for inclusion on this site in 2012. The article is © copyright George Richmond 2012. As a young actor in my home town of Wigan one of my ambitions was to appear on the stage of the Hippodrome; this was not to be. Before I had made my mark on the theatrical scene the Hip, as it was known, had burned down. 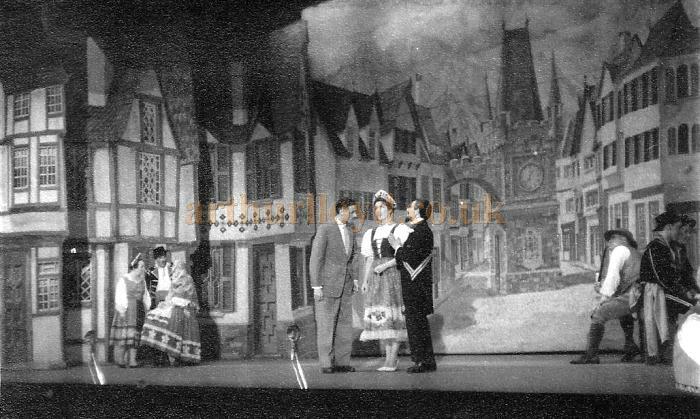 Much of my work was done over the years at the Little Theatre and other venues around the town and in the North West, but at this time I had yet to appear on the Ritz stage. 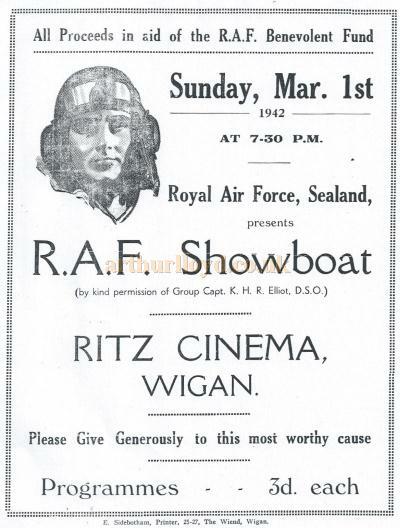 When I returned to the local theatrical scene from my military service in the R.A.F in 1960, the Wigan Operatic Society had already presented three musicals at the Ritz. I had seen the first production Carousel shortly before being posted to the Middle East. During my first year back in civilian life I had appeared in the musical Free as Air as Mr Potter an old man, adding 40 years and in The Matchmaker as a young boy, Barnaby Tucker, losing 5 years. This play would later become Hello Dolly. I was, as can be inferred, a character actor. One of my specialities was theatrical make up (a skill now sadly lacking in many of todays actors, but one that helped me greatly in obtaining roles). These performances and others had caught the eye of the Operatic Societie's Director and I was invited to play the part of Sebastian Sebastian in their forthcoming production of Call Me Madam. I was delighted to accept but before continuing with my experience at the Ritz I will relate some of the problems the stage crew had in mounting the first production, Carousel in the Theatre. The stage manager Peter Peacock, already a friend of mine from the Little Theatre, told me that when he inspected the stage facilities, before renting the Theatre for the first time, he found them to be sadly lacking. No fly floors had been installed when the stage house was built. The grid was accessed via a steel ladder attached to the S.M. side wall of the stage. Only the screen could be flown at that time. A flying system had been installed on the grid but was lacking any ropes. When provided with the necessary hardware to fly cloths etc., these had to be tied off on to cleats at stage level Prompt Side. No counter balances were provided. The existing lighting was controlled from the projection room with redundant controls S.M.side. This was no Grand Master, very basic with the provision for some extra lanterns. The limitations of the stage lighting system was a continuing problem. There was provision for communication between the stage manager and the projection room but no call system back stage; a call boy was used. The sound system was supplied by a local electrical firm for each show and what extra lighting was possible from Strand, later Rank Strand. After the audience had left the building at the end of the film on Saturday night Peter and his crew would move in. The lorries with the sets would back up to the get-in. They would be unloaded and the crew would work through the night until the fit up was finished. After about three hours sleep on the premises the crew would run the show with the director who would arrive at around 8 am, the cast being called for a three Oclock start on Sunday afternoon. The crew, under Peters direction, would go through a reverse procedure on the following Saturday night after the curtain came down on the last performance and return the stage to its cinema state for the first continuous show on Monday. It could be said that I visited the Ritz in its opening week when my mother went to see the first film shown there Lost Horizons. This was in March and I was born in July so my claim is somewhat tenuous. However from a very young age, during the war, I was taken to see many films there, we always attended the first showing at 2pm and sat in the front stalls, the cheap seats. I was entranced by the ever changing colours on the cascade FOH curtains during the intervals. After the show I was occasionally treated to tea in the Café, the waitresses wore black dresses with a white apron and cap. Mother also took me every week to the Hippodrome first house, but thats another story. 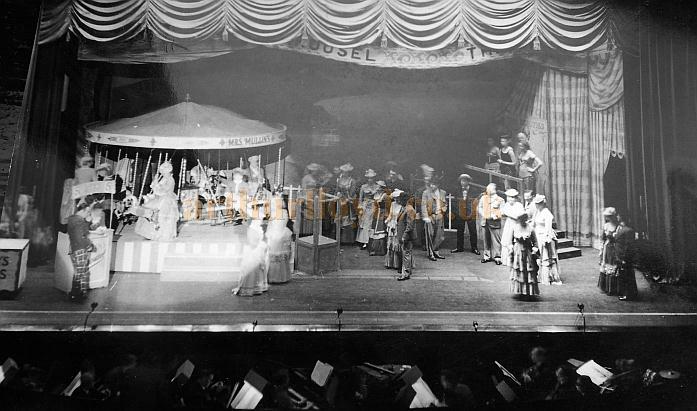 The Operatic shows were rehearsed in the Drill Hall in Wigan and sometimes in a local cotton mill canteen, before moving into the theatre on the Sunday before opening night. Wardrobe was fitted the week before and taken backstage at the Ritz a couple of days before dress rehearsal and placed in pre allocated dressing rooms. 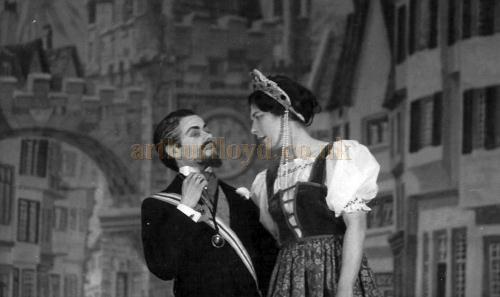 Right - George Richmond as Sebastian Sebastian in the Wigan Operatic Society production of 'Call me Madam' at the Ritz, Wigan in 1962 - Courtesy George Richmond. Call Me Madam was a particularly dressy show and required all the men in the show at one point to wear white tie and tails with proper stiff shirt fronts collars and cuffs. Always impressive when done properly. I remember Gustave, the London Theatrical Wigmakers, a company I had used before, supplied me with my wig and facial hair following a drawing I had sent to them. A local optician fitted and supplied my monocle and my costumes, as were all the others, from Nathans. Let the show commence! The front of house tabs that rose on that first night were not the white cascade that had so entranced me as a child, but replacement bronze velvet travellers, no matter, I was playing in one of the largest Theatres in the northwest, and I loved it! 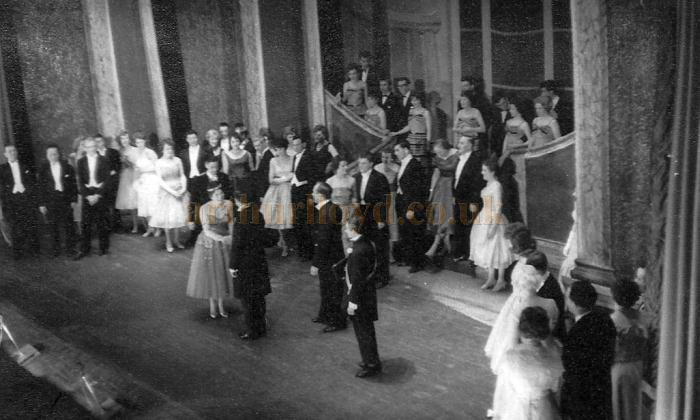 Above - The Wigan Operatic Society production of 'Call me Madam' at the Ritz, Wigan in 1962 - Courtesy George Richmond. I appeared in two more shows for the company, as Ali Hakim in Oklahoma adding 20 years, and as Prince Chululongkorn in The King and I, losing 10 years. I went on to appear in over 20 musicals, revisiting The King and I for a second time, this time to play the King. I enjoyed mixing musicals with the rest of my work .Comedies were my first love, I became engaged to my wife when playing the lead opposite her in a production of Charlies Aunt. Then I graduated to straight plays and in between I directed one play a year for 25 years. For 40 years I had a day job and a night job, and I am amazed now as to how I managed to do it for so long! This article 'Appearing in a Musical at the Ritz, Wigan' was written by George Richmond and kindly sent in by him for inclusion on this site in 2012. The article is © copyright George Richmond 2012.